Befrugal.Com Review: Is befrugal Scam or Legit? Shopping is an important part of everyone’s life which intentionally, also cannot be escaped. Thus, online shopping is gaining much popularity with a fast pace. Therefore, happiness lies in receiving the items ordered online. But it is taking a much greater part of our wallet. 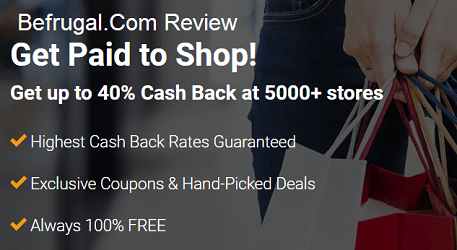 Hence, with this scenario many cash backs sites and companies are rising and such a site which provides cash backs and coupons is befrugal.com. Today, I will review befrugal.com in this article. Befrugal.com is owned by Capital Intellect, Inc. It has its headquarters in Boston, Massachusetts, USA. Therefore, Jon Lal is the CEO and founder of befrugal.com and it started in 2009. Befrugal.com is a cash back and coupon site which offers cash back for online purchases. Befruagl.com partners with 5000 popular stores including 500 largest online stores in USA like Amazon, eBay, Wal-Mart, TARGET, JCPenny, etc. It is actually referred as affiliate marketing which also provide training to newbie’s to make regular income from home. Befruagl.com claims to be able to give 100% cash back from the commission they earn from the shoppers to drive traffic to their website. They even went to the extent of giving 102% of the commission they earn from the stores that feature in their website. Sign up = To sign up through app is only restricted to the users of iPad and IPhone which is available in App store. Other users can sign up via website which is free. The moment you sign up you will receive $10 bonus and then you can proceed shopping. Shop = Once you sign up then you proceed to choose whether you want a cash back or deals and coupons and after that you start shopping. Shop in the normal way as you do and the percentage of the cash back you receive depends on the store you are shopping at. Get paid = After purchasing the items from your favorite store , the amount of the cash back will automatically will be added to your account. How Befrugal.com does pay you? The site provides you various options in which you can be paid. In order to withdraw the cash via PayPal you need a minimum limit of $25. The redemption through check and direct bank deposit which is only available in US, you need minimum balance of $25 each. Thus, visa prepaid card has withdrawal amount of $5 and lastly cash out through e-gift cards whose minimum limit varies. After your request for payment is preceded it takes nearly 10 business days. For returns and exchange most stores takes 60-90 days to pay to the Befrugal, thus the company will pay you back once they receive the money. Befrugal toolbar = The toolbar will help you save money online, in store printable coupon and restaurant. CouponoMatic = This feature is newly added to the toolbar. After you complete your shopping the coupons you are eligible will be automatically added to your cart. Thus, it saves time and efforts to manually copy and paste. Enable cookies = Enable the cookies on your browser as it will help the website to track your transactions history and keep your cash back amount up to date. Weekly ads = The website has a interesting dedicated page which advertises the weekly ads made from the partnered stores. The ads keep on changing every week so you need to check periodically to grab the offers. Befrugal app = The app is available for both the users of Android and IPhone. Drive or Fly calculator = This feature enables the users to decide whether it’s good to travel from car or convenient to fly. You just need to put in the destination and it will show you the most convenient route to travel based on your vehicle model, hotel costs, toll fees, etc. How much you spend on a car = They have included a feature that will help you to save money that you spend on the cars. Befrugal referral program = One more way to earn through Befrugal.com is to refer your dear ones. You will earn $15 for every friend you refer who signs up using your referral link and he will get $10 as signing amount. The company genuinely helps people to save money .It has provided other tools for saving money. It is completely free to join and easy to use. The company even assures you to pay $10 as signing amount. It has received A+ rating by BBB . Support system is very responsive that features live chat sessions. All the products are not eligible for cash back. Personal care and beauty products are not eligible for cash back. Many people who have shopped through Befrugal.com have complained that cash backs takes a lot of time to be credited. After you create an account with Befrugal.com, you should keep yourself prepared for the tons of emails which you will receive daily. The cash out limit is way too high, that is $25 , and thus it will take long time to withdraw. Befraugal.com is scam or legit? Although Befrugal.com cannot be completely mused as scam, yes it is a legit site but has a 50/50 chance of being rewarded. It’s a nice way to earn from those activities which you would do anyway. Therefore, we would recommend you to use trusted cash back sites like Ibotta, Earny, etc.